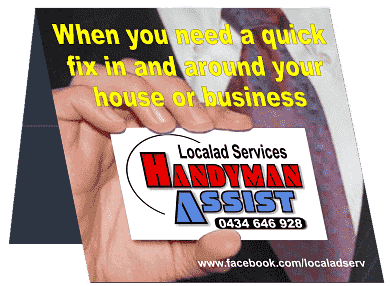 Hi, I’m Andy Robinson, and along with my gorgeous wife Jodie, we are Localad Services Handyman Assist and we’re always here to help you… I’m a full service handyman, generally serving all areas within a 50km radius of Logan Central. While Jodie keeps me on my toes ensuring only the best for you. 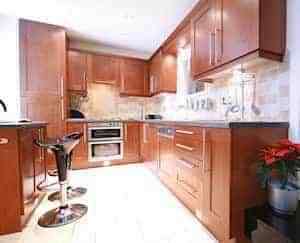 “To make owning any kind of property an easy, stress-free, and enjoyable experience for you”. Every single day, I put in the extra effort to make sure that my customers are completely satisfied with my wide range of handyman services. And by offering excellent value and taking extreme pride in my work, I have quickly established myself as the premier handyman service provider in South Brisbane. But please don’t take my word for it, take a look at what my customers are saying and the companies who put their trust in me. 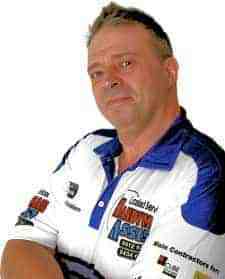 I can fix, repair, or install just about anything you can imagine, and I’m ready and waiting to hear from you. Simply scroll through for more information, or to organise an obligation free quote, feel free to contact me. Or better still, hit the button below and consider all your property to-do lists as good as done! Localad Services - To Get Your To-Do Lists Done! Pictures need hanging, rooms need painting, doors need rehanging, walls need filling, toilets are leaking, and the lists just keep getting bigger and bigger. But now you can stop stressing and simply pick up the phone today for an instant fix. I’ll handle everything on your property to-do lists for you. So you can finally sit back, relax and fully enjoy your home the way you always wanted to. Not only can I take care of your small repair jobs, but I’m also highly qualified to help remodel your entire kitchen, bedrooms or bathrooms. For these larger projects, I will only ever hire the best craftsman to work alongside me, and I’ll even work with you to create the kitchen or bathroom of your dreams. There’s really only one thing getting in your way of a whole new home – and that’s picking up the phone to get things under way. 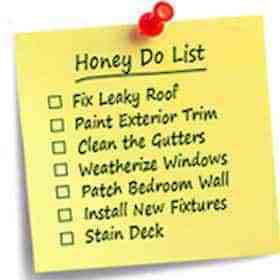 These are just a couple of the comprehensive services Localad Services Handyman Assist can offer. With all trades capabilities and full liability insurance cover, you can rest assured that all works Localad Services Handyman Assist undertake will be expertly carried out, fully compliant from conception right through to completion, by myself and my friendly and helpful operatives, along with a strong focus on customer service, at the right price and to the very highest of standards. Check out my services page for a more in depth view of what I can do for you. If you don’t have the knowledge, time, tools or even the inclination to perform the everyday maintenance tasks around your home, office space or place of business…. 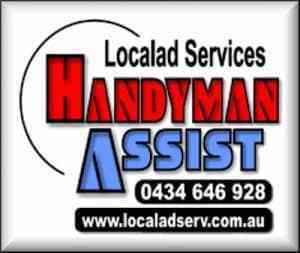 make Localad Services Handyman Assist your first choice today. My number one goal is to make your life easier – and that’s why I started this business in the first place! During any project you may have, I promise you I’ll always show up on time, maintain an impeccable work space, and treat your home as if it was my own. And, if you aren’t 100% satisfied with any of my services, you don’t have to pay me a single cent until I make it right for you. Because somebody once said that it couldn’t be done, But I with a chuckle replied. That “maybe it couldn’t,” but I would be one, Who wouldn’t say so till I’d tried. So I buckled right in with the trace of a grin, On my face. If I worried I hid it. And I started to sing as I tackled the thing, That couldn’t be done, and I did it. Trading as a Handyman in the Queensland area legally requires that we inform you we CANNOT undertake building works valued above $3,300 including materials and GST.